Team-Building days with Flower City Habitat for Humanity are one of the most fun, impactful, and fulfilling volunteer opportunities around. 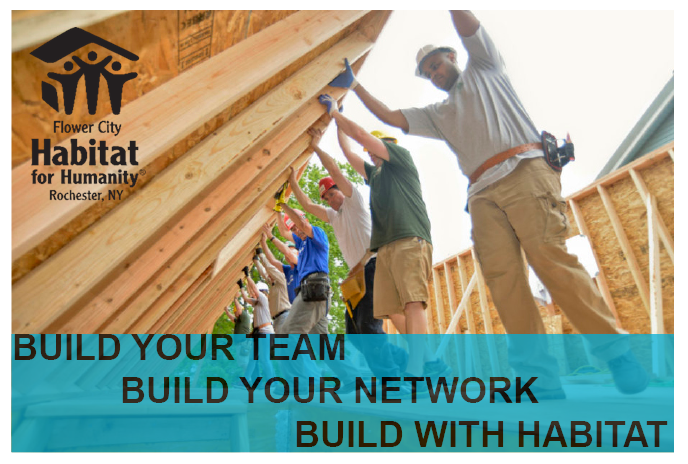 ​Not only do we build quality affordable homes, but we also build your team's network, sense of comradery, and more! No experience or tools needed. Our construction team are trained professionals who will walk you through your assigned tasks while volunteering. We provide all tools, work gloves, and safety equipment; but if you have your favorites, you can bring them. Be flexible and prepared to work. In addition to house construction, our construction volunteers also participate in shed building, landscaping, neighborhood revitalization, and more. We ask volunteers to be flexible and prepared for a good day's work, no matter the task. Age restriction: 16-17 year-old volunteers can build with us only after submitting a parental permission form. No one under the age of 16 is allowed on our construction sites. For more youth volunteering options, head to students and youth. Schedule: Tuesdays are 12-4pm. Wed-Sat can be a full day (9am-4pm) or a half day (9am-1pm). Saturdays are the most requested day, so if you can make it on a weekday, please choose that first. Lunch: For full day shifts, please bring a bagged lunch to eat at the construction site. For half-day shifts, please eat before arriving. If your company/organization would like to provide lunch for your group, please let us know when you schedule your day. Attire: Dress for the weather, plan to work outside, and expect to get dirty! We recommend hard-soled work shoes or hiking boots, old work clothes, and dressing in layers. No sandals or flip-flops, you will be sent home. We also recommend a hat or sunscreen for hot weather, and hand sanitizer or baby wipes for lunch. On-site amenities: Drinking water is available but please help us save money and reduce waste by bringing your own reusable water bottle. Portable toilets are available on our construction sites. On-street parking can usually be found within a block or two, but if you are volunteering with a group, please consider carpooling. Weather: We work year-round as long as conditions are safe. For issues of inclement weather, our construction sites will close when the Rochester City School District closes. ​Meetup location: Currently, all of our construction projects are within the City of Rochester. Additional details including meetup location will be provided once you are scheduled. Many of our team-building days are connected to one of our larger volunteer programs (faith based groups, global village, students and youth, veterans build, women build, and young professionals.) Though this is not required, connecting your team to a program adds the benefit of tying promotions into the successes of the program, often a specific house that is under construction and being invited back to the dedication of the house! For companies, or other organizations looking to benefit from partnering with one of the top social service brands (five years in a row), we can also discuss additional marketing and promotion that we can provide.